Of all the iconic early deep house records—and of all those that were created by Larry Heard—the Another Side album he released with his collaborators in the Fingers Inc. trio (Robert Owens and and Ron Wilson) stands out. It’s one of the most enduring records in the history of house music and, although it’s not the first full-length house record (that honor would go to JM Silk), it is the one that defined what house could be as an art form. Originally released as a double album in 1988 on Jack Trax, it will now receive a proper triple-vinyl reissue on Heard’s long-running label Alleviated. Interdimensional Transmission’s Brendan Gillen compiled the story of how it all came together as told by the people who made it happen. Larry Heard: Robert Owens is naturally a star. Robert and I both come from the world of improvisation, so it wasn’t a big thing to just mess around with the music. There was chemistry right away—anything I put in front of him, he could just wing it and do something that felt really appropriate for the musical idea. Robert Owens: [Larry Heard] would create instrumentals constantly and I would be the one to say, “Oh wait, I got something that would go with that.” I was always more the DJ and he was more the professional musician. LH: Well, actually, [Another Side] was happening on its own before [Jack Trax label founder] Damon D’Cruz showed up. He just showed up at a good time. Once Robert and I got connected with each other, we would just output—cranking out ideas so quick. That naturally progressed into, “Yeah, we gotta do an album,” and then it grew into a double album before we even realized. LH: “Mysteries” is the one that includes Robert, but the one from the year before, before I’d even met him, is called “Mystery of Love.” The instrumental version started everything for us. The label tested out a few names before settling on Alleviated. For that reason, the original version of “Bring Down the Walls” was released under the banner Select Records, attributed to the artist name Robert Owens. This is the same version that ended up on Trax. LH: It’s the exact same master [as the version that Trax Records released]. I just got [Trax boss] Larry Sherman to expedite the process. Even the vinyl end bands have the same markings. RO: I think Larry Levan had it on cassette first. They were listening to it in the Paradise Garage, and I was like, “Oh, they’re gonna hear all the mistakes.” There’s a doorbell that rings on the track, and when he played it out, people at the Garage screamed because they thought the doorbell was a sound effect! RO: I used to work in shipping and receiving at Evanston Hospital. I did inventory and stock for all of the different departments in the hospital. They had these private bathrooms you could lock yourself in. I’d do all my rounds quick and then I’d go into the bathroom and start writing songs on toilet paper. I think I wrote “Bring Down the Walls” and “Never No More Lonely” on toilet paper sittin’ there. RO: “A Path” also came out around the same time as “Mysteries,” which was a really stripped version. I added the Virgo [Marshall Jefferson’s alias] beat to the end of it and gave it more kick. Frankie heard that and was like, “Oh give me that!” I gave it to Frankie and he extended my ending a little. Frankie’s version of my edit became really popular through him playing it out at The Power Plant. On the heels of this popularity, Fingers Inc. recorded a fully electronic version for DJ International in 1986 that was engineered by Chip E. This version could not be included on the Jack Trax album, so another fully electronic prototype was used, which was far more raw but retained a bassline from Sly & the Family Stone that appeared on the unreleased original. LH: “A Path” is another prototype. Instead of being bothered with DJ International trying to come in and be a pain, I said, “Ok, we’ll just use these alternate recording here that I have.” Everybody keeps forgetting that I have the archive. You may have a version, but somebody else has all the prototypes. RO: You know when it’s like we’re being guided by higher sources? That’s where spirituality comes from, and that’s where the lyrics for “A Path” came from. I’m removed from the whole church process, but for me, spirituality is just being relaxed and allowing natural organic energy to come into my mind. Harry Dennis is the spoken word poet of house. 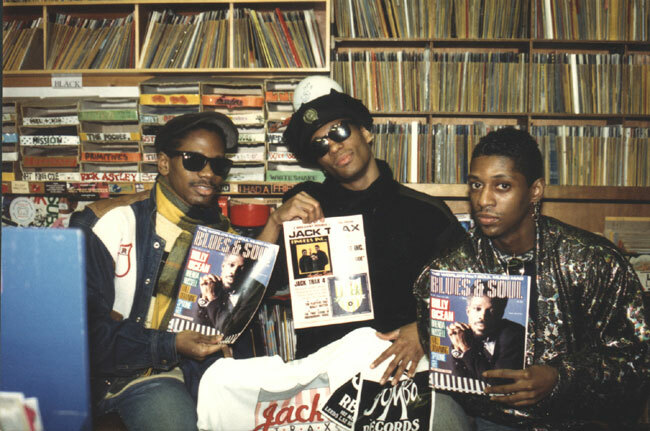 After first collaborating with Larry Heard and Robert Owens as part of the house music supergroup The It (which also included Chip E. and Ron Hardy), he was invited by Larry to contribute a science-fiction sounding song to the album. Jack Trax marketed “Distant Planet” on 12” vinyl as “deep moody house” and procured a Frankie Knuckles mix. Harry Dennis: Since Robert Owens was a Muzic Box bud, me and him became friends. We became The It, and and we did that record “Donnie.” That was the first mix Ron Hardy ever did, “Donnie.” He said this record was gonna be his, you know? He made a classic out of it. He played it at the club so much that kids went crazy for it. And the rest is really history. Then Larry asked me to collaborate on “Distant Planet” for their album. That’s some deep house. You know, “Life on this distant planet, far far away from here, where everyone can walk, without no fear for fear. Caring and sharing is a day-to-day chore, you can eat the fruit around, you don’t hunger never more.” It’s basically deep if you listen to it. LH: Damon D’Cruz had sense enough to know even at that time to involve someone else, just like Ron Hardy had been involved with “Donnie.” Now he was gonna attach Frankie Knuckles to “Distant Planet.” Typical corporate kind of approach, right? LH: I had the track and I think at that time we were living in the same building. He was just across the hall from me. He was so close that when I had an idea I could knock on his door and say, “What do you think about this?” And then he would just say, “Of course!” He said it felt sleazy, so immediately, there was the title. We didn’t have to think a whole lot about it, it just formed itself as he listened to the mood of it. He kinda filled in the blanks with the right words. RO: I heard the music and then I wanted to add feelings—sleazy, but not too far over the edge. Ron Wilson was brought into Fingers Inc. to give the group a more Motown appearance, and was the second vocalist on Another Side. His father was Paul Wilson of Doo Wop stars the Flamingos (“I only Have Eyes for You”). Ron was a dancer who worked with Larry at the Social Security Administration office. He later appeared on Alleviated in 1990 with Prove It to Me and disappeared from the music world shortly afterward. “Bye Bye” exhibits the best vocal blend of Robert Owens and Ron Wilson on the album. RO: I wrote the lyrics and hooks and I asked Ron [Wilson, the third member of Fingers Inc.] which area he’d feel most comfortable with. The first verse, the second verse? Then I gave him the melody of the hooks and the chorus, and we just practiced that together ’til he got where I was coming from. LH: That was a prototype, so that would be the original. There are two existing mash-up versions of “Can You Feel It”: one with Chuck Roberts, using an acapella of Rhythm Controll’s “My House,” and another using Dr. Martin Luther King’s “I Have a Dream” speech. Both mash-ups were performed by Eddie Richards for Jack Trax Records in London. LH: We were pretty much just having fun as far as the recording part. It wasn’t as calculated as everybody seems to want to hear you say—it was just done off the cuff.